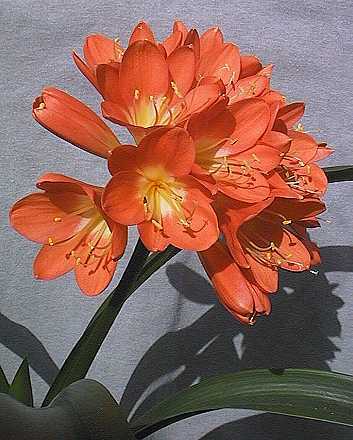 For years, despite raising several of the Amaryllidaceae from seed, I avoided Clivia on the grounds that it was 'common' (all garden centres seem to have it, often persuaded into flower unnaturally at Christmas). But I finally succumbed, and bought this as a small plant some years ago. It has just flowered for the first time (April 2001) and I have realised what I was missing! Borne above the strap-like leaves, this flower spike has 15 individual flowers, each approximately 5cm in diameter. The plant is evergreen, and despite usually being called a bulbous plant, it cannot be said to possess a bulb.